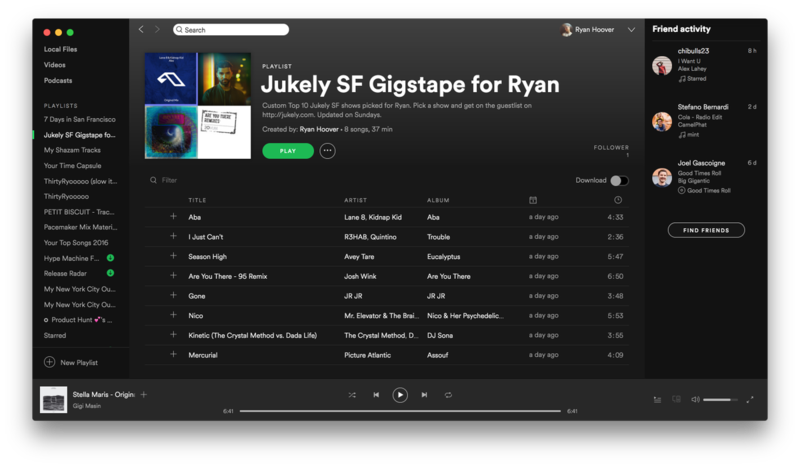 Connect your Spotify and Gigstape will create a playlist based on your listening habits of artists performing in your city this week at shows Jukely can get you into as part of our concert club membership. Would you recommend Gigstape to a friend? Larry Marcus has used this product for one week. LOVE this! It's WAY too hard to discover cool new music to see live. I tried something like this in the form of a blog/bi-weekly email a few years ago in Seattle and it got a lot of traction quickly. Curious if you have plans to expand the breadth of artists in the future? Using Soundcloud vs. Spotify, for example, would allow you to include more cool, emergent artists who fly under the radar.